Now I don’t normally buy very expensive nail polishes, but an opportunity came up that I couldn’t resist so now I own my very 1st luxury polish - Chanel Nouvelle Vague. Need I say more! So the boy and I were shopping in the city about 2 weeks ago and as usual I was drooling over countless products in the Myer beauty department. I was drooling over the Chanel 2010 Summer display and the boy told me to just bite the bullet and buy the darned polish if I wanted it that much. Now don't get me wrong, I love to indulge myself on the rare occasion but $39Aus for ONE nail polish is just RIDICULOUS. For that price I could purchase almost 20 Ulta 3 polishes! Of course it’s not the same but you can see the crazy mark ups Aussie girls have to deal with when it comes to beauty items. I resisted and we left the store but he insisted I get the polish and offered to go halves with me as a gift for getting through my assessments so back into the store we went. The rest they say is history and this little aqua baby is all MINE! It was the last bottle they had – someone had put it on hold but never picked it up so their loss was my gain. I also had a $20 Myer gift card that needed to be used so this polish comes guilt free as I didn't break my shopping ban. YAY! Nouvelle Vague is a gorgeous shade of aqua which is very similar to China Glaze For Audrey but with very subtle shimmer through it. It’s difficult to see the shimmer unless you’re in sunlight or direct light. Application was a bit of a pain which I was expecting after reading reviews. The formula is a little thick which is disappointing. I’ve been debating whether or not to thin it.. any suggestions ladies? The 1st coat was a streaky mess and it took another 2 to get it perfect. Below is 3 coats. All in all an absolutely gorgeous polish however the formula could use some improvement. I will leave you with some picture spam of the jewel of my polish collection!! Don't forget to enter my 50 followers giveaway HERE! Ohhh....I want this polish so bad! It's crazy how pricey things are in Australia. Even MAC! Love the polish though. Very nice color..especially for summer. Too bad I couldn't afford it. That's ridiculously expensive for a nail polish bottle. Glad you enjoy it! It reminds me of For Audrey from China Glaze. And I agree. I don't understand why EVERYTHING is inflated at x100 here is AUS. I love this on you! 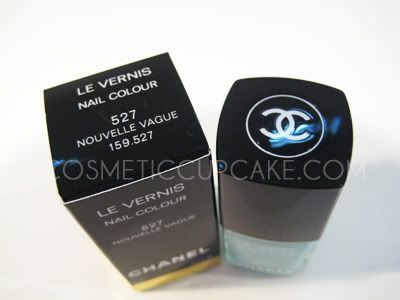 How much are Chanel polishes in the Au? Gorgeous! It looks great on you. @Ansa: It's just crazy! I usually wait for my annual trip to HK to get beauty items but I couldn't resist hehe. @Juznie: It's out of bounds for me too but I had a little help this time! I love the colour but the formula of it is a bit annoying. @Serenademee: I think For Audrey is pretty much a dupe for Nouvelle Vague but without the shimmer. The formula of For Audrey is actually much better! ARGH. It's totally not fair! It's times like these I wished I lived in the States or Asia. @Katie: Thanks Katie! RRP is $39Aus. Crazy! @Savvy: Thank you! I really appreciate that you stopped by to comment and follow of my little blog. Cheers! 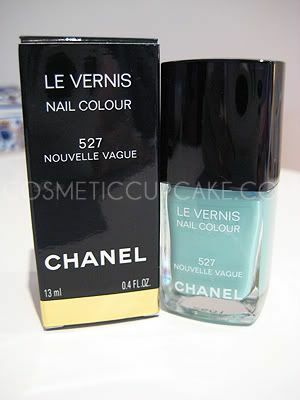 I love Nouvelle Vague <3 I chanced upon this colour while waking past a chanel display at the department store but I had to sadly walk away cos of the price! :( Serious its ridiculous! @Puranki: Thank you! I agree it's a great summery colour! @Donna: Yeah I think For Audrey is slightly darker too but it's a pretty close match for a fraction of the cost! I haven't compared them though but other blogs have. Have fun with For Audrey! It's a great polish.